Whoohoo! It’s wild and free! Today is the release date for The End Has Come, the last volume in the Apocalypse Triptych edited by John Joseph Adams and Hugh Howey, containing my story Wandering Star. My story, Wandering Star, is a bit of a funny one, because it’s not strictly about what happens after the apocalypse. It’s built of glimpses from both before and after the apocalypse, and is about loss – loss of the future, but also loss of the past. 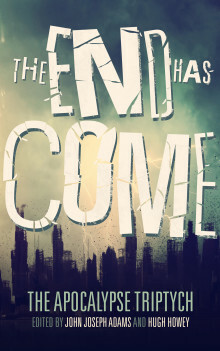 The End Has Come contains new stories from the likes of Seanan McGuire, Elizabeth Bear, Ken Liu, Jonathan Mayberry, Nancy Kress, Charlie Jane Anders, Hugh Howey and loads more. At the moment it’s available in trade paperback and for Kindle from Amazon, with other ebook formats to follow on 1 August. Congratulations! That is a truly awesome ToC to be part of. Thanks! I am a bit ecstatic!